In Cisalpine Gaul, a Carthaginian patrol is moving stealthily through thick woodland. 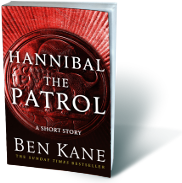 It’s led by Hanno, one of Hannibal’s young officers, and his second-in-command Mutt. Famished and cold, they are making for a town full of the grain that they desperately need. But the local Gauls cannot be trusted; and although defeated, the Romans still have patrols in the area. This short story is set just before the opening of Hannibal: Fields of Blood.